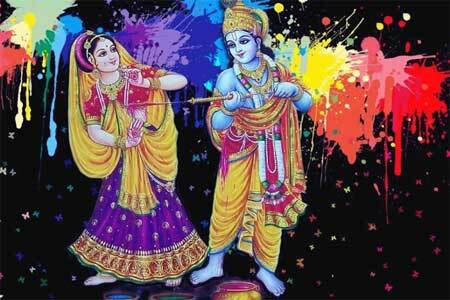 Holi Festival and Lord Krishna - How is Holi Celebrations Related to Sri Krishna? The Holi festival heralds the advent of spring season and a new world of hope, color and gaiety. Celebrating the beauty of nature through natural colors was Lord Krishna’s way of teaching us that our existence on this planet solely depends on a beautiful and calm Mother Nature. The most colorful and wildest of Holi celebrations take place in Vrindavan, Mathura and in the nearby villages like Barsana. The festival here recreates the magic in which Lord Krishna played Holi with Radha and the Gopis, splashing color all over. In some regions, Holi is celebrated in memory of Lord Krishna annihilating evil in the form of a Demon. The name of the demon varies from region but in essence in all regions, Holi festival is the celebration of the victory of good over evil and a sort of thanksgiving to Nature. In some parts of North India, the lighting of fire is dedicated to killing of Demon of Putana by Lord Krishna. In most regions, bonfires are lit to celebrate the death of Demon Holika. Holi in Lord Krishna’s playground of Vrindavan and Mathura begins with Vasant Panchami and includes numerous celebrations like Ladoo Holi, Lathmar Holi etc. In eastern parts of India, Holi is celebrated for nearly a week and the highlight is the swing festival of Krishna and Radha. The festival there is known as Dol Jatra or Dola Purnima.